Toronto may not have a reputation for being a city that never sleeps, but it does have a vital and varied nightlife scene. It's a mecca for top-notch theater -- you can sometimes see Broadway shows before they reach Broadway. The Toronto Symphony Orchestra is world renowned, and the city's many dance and music venues host the crème de la crème of international performers. Some of the best entertainment is in Toronto's comedy clubs, which have served as training grounds for stars such as Jim Carrey, Mike Myers, Dan Aykroyd, and John Candy. The nightclub scene moves at a frenetic pace. Martini bars are perennially popular, though lower-key pool bars are in vogue, too. Making Plans -- For listings of local performances and events, check out Where Toronto and Toronto Life (www.torontolife.com), as well as The Globe & Mail (www.globeandmail.com), the Toronto Star (www.thestar.com), and the National Post (www.nationalpost.com). For up-to-the-minute lists of hot-ticket events, check out the free weeklies Now and Eye, available around town in newspaper boxes, and at bars, cafes, and bookstores. The city website www.toronto.com also boasts lengthy lists of performances. Events of particular interest to the gay and lesbian community are listed in Xtra! (www.xtra.ca), another free weekly available in newspaper boxes and many bookstores. Getting Tickets -- For almost any theater, music, or dance event, you can buy tickets from Ticketmaster (tel. 416/870-8000; www.ticketmaster.ca). There's a service charge on every ticket (not just every order) sold over the phone. To avoid the charge, head to a ticket center. They're scattered throughout the city; call the information line for the lengthy list of locations. Toronto's arts scene offers something for everyone year-round. The city's arts institutions are widely renowned, and many top-notch international performers pass through town. Discount Tickets--Want to take in a show, but don't want to spend a bundle on it? Drop by the T.O. Tix booth (tel. 416/536-6468, ext. 40), which sells half-price day-of-performance tickets. The booth is currently located in the Yonge-Dundas Square, which is just across the street from the Eaton Centre. T.O. Tix accepts cash, Visa and MasterCard, and all sales are final. The booth is open Tuesday through Saturday from noon to 7:30pm; it's closed Sunday and Monday (tickets for performances on those days are sold on Sat). Good to Know: Nightlife--The drinking age in Ontario is 19, and most establishments enforce the law. Expect long queues on Friday and Saturday after 10pm at clubs in the downtown core. Bars and pubs that serve drinks only are open Monday through Saturday from 11am to 2am. Establishments that also serve food are open Sunday, too. If you're out at closing time, you'll find the subway shut down, but special late-night buses run along Yonge and Bloor streets. Major routes on streets such as College, Queen, and King operate all night. Theatre--While it may seem that Toronto favors big-budget musicals -- The Lion King and The Phantom of the Opera both made a big splash here -- there are many excellent smaller companies, too. Many of the smaller troupes have no permanent performance space, so they move from venue to venue. The best time to capture the flavor of Toronto's theater life is during the Fringe Festival (tel. 416-966-1062; www.fringetoronto.com; fringe@fringetoronto.com), usually held for 10 days starting in early July. In July and August, try to catch the Dream in High Park (tel. 416/368-3110). It mounts stunning productions of Shakespearean or Canadian plays from the CanStage company in an outdoor setting. Don't forget that two major theater festivals -- the Shaw Festival in Niagara-on-the-Lake and the Stratford Festival in Stratford -- are only an hour or two away. Classical Music & Opera--Visitors can check to see what's playing at churches around town. Possibilities include Trinity-St. Paul's Church, 427 Bloor St. W. (tel. 416/964-6337), the home of the Toronto Consort, performers of early music; St. Patrick's Church, Dundas and McCaul streets (tel. 416/483-0559); and St. James' Cathedral, King Street East and Jarvis Street, where the Orpheus Choir sings. The University of Toronto (tel. 416/978-3744 for the box office) offers a full range of instrumental and choral concerts and recitals in Walter Hall and the Macmillan Theatre. It's also worth checking out who's performing at the Royal Conservatory of Music, 273 Bloor St. W. (tel. 416/408-2825). If you're a fan of new music, look out for the Sonic Boom concert series (tel. 416/944-3100), which produces new opera and other contemporary music. Pop & Rock Music Venues--Everyone comes to Toronto -- even Madonna, who ran into some trouble with the obscenity police a while back. Tickets are available through Ticketmaster (tel. 416/870-8000). In addition to the previously mentioned Hummingbird Centre and Massey Hall, these are the major pop and rock music venues. Comedy Clubs--Toronto must be one heck of a funny place. That would explain why a disproportionate number of comedians, including Jim Carrey and Mike Myers, hail from here. This is one true Toronto experience you shouldn't miss. Jazz, Rhythm & Blues--The BamBoo also offers some of the hottest jazz in town. Check out www.tojazz.com for the latest listings. Dance Clubs--Dance clubs come and go at an alarming pace -- the hottest spot can close or turn into a decidedly unhip place almost overnight -- so keep in mind that some of the spots listed below may have disappeared or changed entirely by the time you visit. Some things stay constant, though. One is that, with few exceptions, everyone lines up to get into a club -- so don't get the idea that charming the bouncer will get you in faster. Most clubs don't have much of a dress code, though "no jeans" rules are not uncommon. I have indicated what the current scene looks like, but it will almost certainly change, so be sure to call ahead. The club listings in the free weekly Now are consistently the best. Several primarily gay and lesbian clubs attract a sizable hetero contingent; one notable destination is El Convento Rico. The current night scene encompasses a flock of attractive bistros with billiard tables. You can enjoy cocktails, a reasonably priced meal, and a game of billiards in comfortable, aesthetically pleasing surroundings. The cigar bar is still in vogue, and most clubs have a humidor for the stogie set. Unlike dance clubs, the bars and lounges in Toronto are a pretty stable bunch. Hotel Bars--Just as some of the best restaurants in the city are in hotels, so are some of the most charming watering holes. While I'm all for heading out and experiencing what a city has to offer, don't overlook these options in your home away from home. Accents -- This romantic wine bar offers many selections by the glass. The lighting is flattering, and a pianist provides jazz background music throughout the evening. Given how popular the Sutton Place is with the Hollywood glitterati, it's no surprise to see stars pass through the bar. At the Sutton Place Hotel, 955 Bay St. tel. 416/924-9221. Subway: Museum or Wellesley. The Consort Bar -- This is a wonderfully clubby, old-fashioned bar. Not only does it boast comfortable wing chairs, but also its 2.5m-high (8-ft.) windows onto the street afford excellent people watching. The suited-up crowd is generally more corporate than romantic -- with some sweet exceptions. At Le Royal Meridien King Edward, 37 King St. E. tel. 416/863-9700. Subway: King. La Serre -- This piano bar offers a full range of single malts and martinis, and welcomes cigar aficionados. Located at street level, it's a great place to people-watch along Yorkville Avenue. One caveat: The live piano music refuses to remain in the background. It's so noisy that I find it impossible to talk -- but the suits don't seem to mind. At the Four Seasons Hotel Toronto, 21 Avenue Rd. tel. 416/964-0411. Subway: Bay. The Library Bar -- This intimate, wood-paneled bar is the best place in the city to order a top-quality martini, which is served in a generous "fishbowl" glass. With its leopard-print couches and wingback chairs, it has an old-fashioned, almost colonial feel. I think it's one of the most romantic settings in town. At the Fairmont Royal York, 100 Front St. W. tel. 416/863-6333. Subway: Union. The Roof -- Author Mordecai Richler called this the only civilized spot in Toronto. It's an old literary haunt, with comfortable couches in front of a fireplace, and excellent drinks. The walls sport caricatures of members of Canada's literary establishment. The James Bond martini -- vodka with a drop of lillet -- is my personal favorite. The view from the outdoor terrace is one of the best in the city. At the Park Hyatt Toronto, 4 Avenue Rd. tel. 416/924-5471. Subway: Museum or Bay. 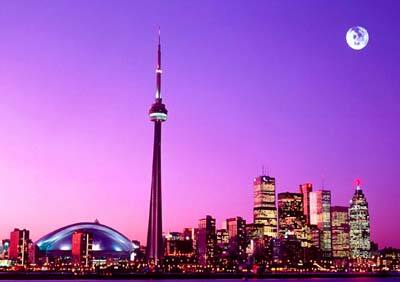 Toronto's large, active gay and lesbian community has created a varied nightlife scene. At some nightspots, such as the Phoenix Concert Theatre, one night a week is gay night (in this case, Thursday). There is no shortage of movie theaters -- in fact, monster megaplexes are the rage at the moment. The largest theaters are at the Eaton Centre, St. Lawrence Market Square, and Yonge and Eglinton. Cinemas with a mere pair of screens can be found at the Sheraton Centre, Bloor and Yonge, and Yonge and St. Clair. Check Now, Eye, or one of the newspapers for listings. While Starbucks has certainly staked out territory in Toronto, the Canadian chain the Second Cup is holding its ground. It offers a full range of flavored coffees and espresso varieties, plus cakes, muffins, croissants, and gift items. Another chain, Timothy's, invites you to pour your own selection from about 10 varieties. My favorite coffeehouses are all independents, though.